Recently we were excited to find a collection of old reclaimed barn wood stored in a barn in Middlefield. 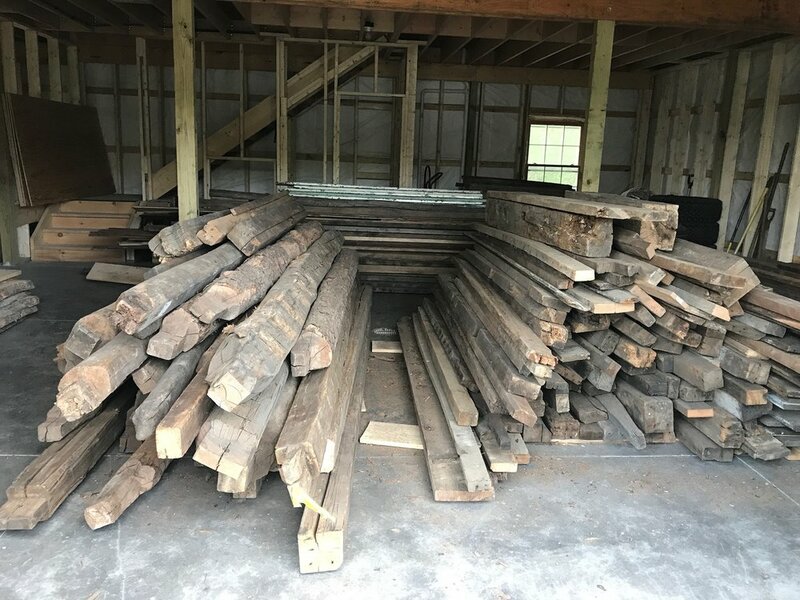 Included in the stash were pole beams up to 16' long from an 1845 home. Needless to say, we bought the whole lot. It is all now in our SlainteHome barn. Some of the reclaimed wood we will use for building furniture and accessories. Some of the wood will be used for special built-in features like beamed ceilings, fireplace mantels, kitchen islands, and bathroom vanities, etc.. But we do have more than just a bit of it, so some of the wood is for sale now by appointment. We have started moving all the wood we have into our new barn and work shop as well. Some is reclaimed in addition to the wood mentioned above. It ranges from old 2x4's that framed walls to structural beams. Other wood in the barn is the high character wood that you see in the items we make. Most of it is in slab form. Some has live edge some does not. It has been in the barns of various friends while we were building our barn. So if you want something custom made we have a good selection for creating your special something. Please contact us with any questions.